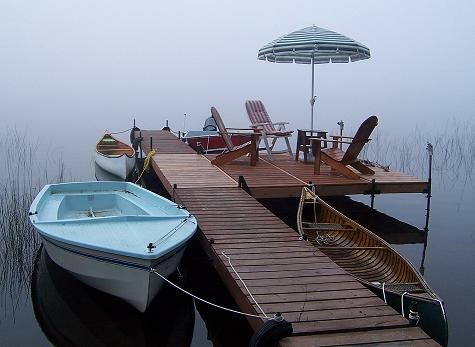 A popular waterfront feature (at least on our lake) is the dock deck. This provides a pleasant area to sit out and watch the world go by, and where mosquitoes are kept away by the breeze. 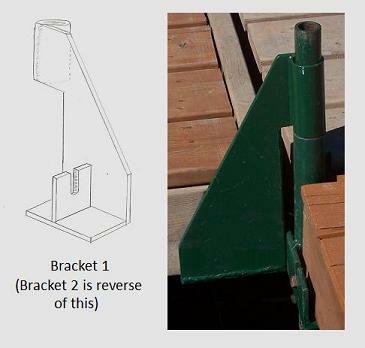 Brackets 1 and 2 are used to attach the edge of the deck to the dock, and slip over a protruding pipe leg above the dock support bracket, as shown in this picture. 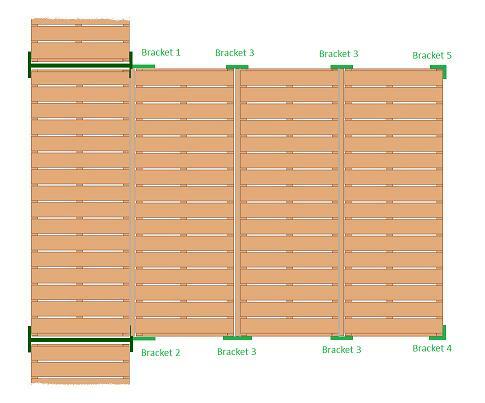 Bracket 2 is the reverse of bracket 1, and is situated at the opposite end of the deck section from Bracket 1. 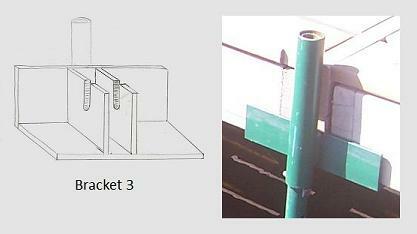 Bracket 3 is used to support the ends of adjacent deck sections. 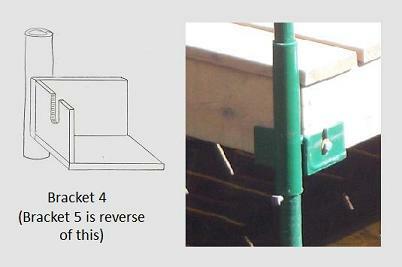 Brackets 4 and 5 support the outer corners of the deck on the section furthest from the dock itself. Please note that the diagrams are not to scale. Although dock support brackets such as those shown earlier can be found all over cottage country, their dimensions are not all the same. If you plan to copy this design, you must determine the measurements of your dock supports first, then design your deck brackets with the same dimensions. With this design, a gap is left between each deck section. I filled this by using 2x4's resting on small blocks of wood which themselves are resting on the bottom support plate of the brackets. You can see the 2x4's in the photos of brackets 1 and 3 above. In case you're wondering, I did not make the brackets myself; they were fabricated by a local welder from my detailed plans.